● ● Create as many Mind Maps as you want. ● ● Virtually unlimited page size and number of elements. ● ● Unique Free lay-out to organize your ideas exactly how you want it. ● Three additional auto-layouts: Vertical, Top-down and List. ● ● Multiple Mind Maps on one page. ● ● Add topics and siblings easily. Drag, rotate, (re)arrange or reconnect topics and branches. ● Create crosslinks to connect any 2 topics on the Mind Map. ● ● Use snap to grid and snap to guidelines to align topics. ● Share the Mind Map as .pdf, image, outline, freemind or opml. ● Print as mind map or outline. ● Add images or photos. ● ● Add notes to topics, ideal to add more information without cluttering your Mind Map. ● Add labels or call-outs to topics and relations. ● Use the build-in stock icons or your own icons. ● Add links to Mind Maps, link to a specific topic on a Mind Map. ● Use checkboxes, progress bars and auto numbering. ● Android and iPad/iPhone only: Add video recordings. ● Android and iPad/iPhone only: Add voice memo’s. ● ● Outline view. Drag drop to restructure. ● Live checklist, To Do list, Done list. ● ● Collapse or expand branches. ● Hide or show individual topics or branches. ● ● Show group borders to highlight a branch or set of topics. ● Search for text in the Mind Map editor. ● Desktop only: Advanced search options: search for checkbox state (unchecked, checked) or icon. 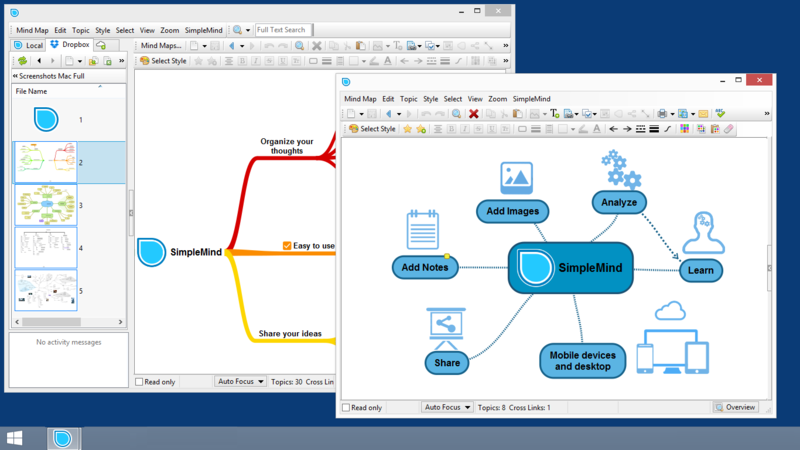 ● Desktop only: Open mind maps in multiple windows. ● ● Apply one of the many build-in style sheets. ● Create custom style sheets. Customise colors, lines and borders. ● Change the style and color for the whole Mind Map or change a single element only. ● Manually adjust relation paths (bend lines). ● Merge paths and create summaries. ● Pick colors from the style color palette or choose custom colors. ● Seamless synchronization across platforms and devices using Dropbox, Google Drive, NextCloud and 坚果云 – Nutstore (not Android). ● Store mind maps in any folder, for example in iCloud Drive. Use the cloud’s app to sync mind maps across platforms and devices. (not Android). ● Import Mind Maps. Opens .smmx (native), .opml and freemind .mm files. ● Organize Mind Maps in Folders. ● Create a new (linked) Mind Map from selection. ● Search for Mind Maps. ● Desktop only: Create a mind map displaying the bookmarks of a pdf. Each topic links back to the corresponding page in the original pdf. * SimpleMind+, with in app purchase, has the same features as SimpleMind Pro. The Desktop trial, available only via the website, also has the same features.